Innovative cell volumizing formula that HALEO developed for athletes. Innovative CreaVol formula that is superior to pure creatine supplements in helping to build muscle strength and size is the first Cell Volumizer. 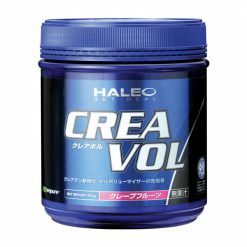 The origin of CreaVol’s name comes from “creatine” and “volumizer”. The added blend of amino acids in CreaVol exceeds the potential of creatine alone for boosting muscle power and size. Through the addition of arginine, glutamine, and glycine, CreaVol supports cell enlargement and hydration. This serves as an important foundation for building more muscle. Additionally, CreaVol has added phytate (IP6) to further boost its effectiveness compared to creatine alone. 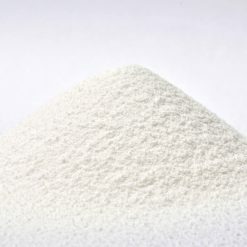 IP6 is a natural rice and grain extract that contains large amounts of phosphate. Creatine phosphate can be stored and used when needed to restore depleted energy stores of ATP. Due to changes in production methods, the powder will appear more granular than normal. This does not indicate any problems with quality and content. Recommended usage will be changed to 2 tablespoons as a consequence. The target product expiration date is January 2018. Take 3 scoops daily mixed into 150mL (per scoop) of water or your beverage of choice. Take 2 scoops daliy mixed into 150mL (per scoop) of water or your beverage of choice. The powders look different from the original one if its expiration day is set after Janurary 2018. We recommend that you use in the morning, before and after training.